As the subject of a popular web reality series, Suzanne Barston and her husband Steve became a romantic, ethereal model for new parenthood. Called "A Parent is Born," the program's tagline was "The journey to parenthood . . . from pregnancy to delivery and beyond." Barston valiantly surmounted the problems of pregnancy and delivery. It was the "beyond" that threw her for a loop when she found that, despite every effort, she couldn't breastfeed her son, Leo. This difficult encounter with nursing--combined with the overwhelming public attitude that breast is not only best, it is the yardstick by which parenting prowess is measured--drove Barston to explore the silenced, minority position that breastfeeding is not always the right choice for every mother and every child. 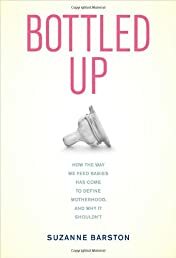 Part memoir, part popular science, and part social commentary, Bottled Up probes breastfeeding politics through the lens of Barston's own experiences as well as those of the women she has met through her popular blog, The Fearless Formula Feeder. Incorporating expert opinions, medical literature, and popular media into a pithy, often wry narrative, Barston offers a corrective to our infatuation with the breast. Impassioned, well-reasoned, and thoroughly researched, Bottled Up asks us to think with more nuance and compassion about whether breastfeeding should remain the holy grail of good parenthood. Is Breast Best? : Taking on the Breastfeeding Experts and the New High Stakes of Motherhood (Biopolitic..